At Storage Direct, we think about security a lot. It’s part of the job. Our clients want to know that we’re taking good care of their stuff. Plus, if we’re being honest, we’re just kind of into it. Keeping ever-vigilant for would-be interlopers, outmaneuvering would-be heists… the idea makes us feel like dashing fortress castellans, breaking sieges and preserving the honor of the realm! Ok, so maybe our jobs aren’t quite as romantic or epic as defending castles or defeating villains. Point taken. It doesn’t mean we’re any worse at defending our (admittedly small) realms from attacks of any shape or size! In fact, we think we’re better than those snooty, “historically, culturally, or aesthetically relevant” feats of engineering that are apparently so impressive. We’ll prove it! 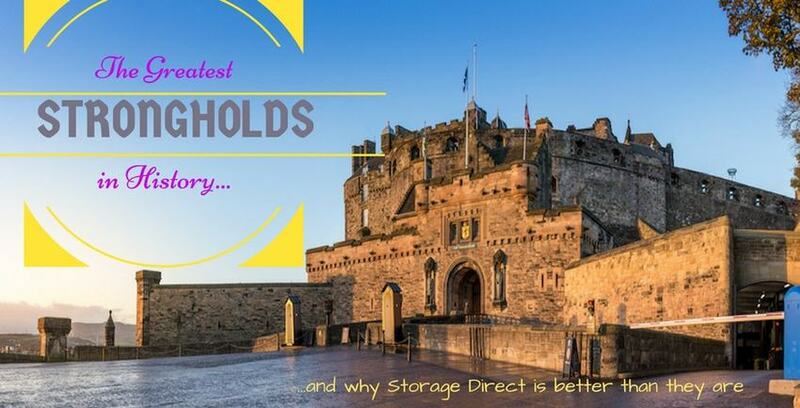 Here are two of the most impressive fortresses ever built by mankind, and why Storage Direct has them all beat in the self-storage security department. What’s good, ancient history?! The legendary Richard the Lionheart personally supervised construction of The Chateau Gaillard. Famously expensive and difficult to build, Gaillard became one of the earliest structures to incorporate architectural principles ubiquitous with the great European castles, including concentric fortification and machicolations. Built on a naturally defensible hill overlooking the River Seine and boosting three tiers of defensible enclosures separated by a moat and a keep of thick, hard stone in the middle, Chateau Gaillard was the most imposing fortress of its time. Richard had The Chateau built in an unheard-of two years so that he could use it as a means to defend his duchy of Normandy, and also (being Richard the Lionheart) so he would have a forward base for his campaign to retake Vexin county from the French. The then-King of France and Duke of Normandy became so obsessed with completing his famous fortress that William of Newburgh once quipped, “even if an angel had descended from heaven to urge its abandonment, it would have been roundly cursed.” When the chateau was finished, Richard made it his residence of choice, calling it his “fair daughter” and joyfully throwing prisoners from its rampants. Richard enjoyed the fruits of his (well, his servant’s) labors for all of a year, and then he died from an infected arrow wound sustained during a siege. Alright, so an obsessed lunatic constructed Chateau Guilliard to be the biggest, baddest, most invulnerable fortress of its time. It’s an impressive pedigree. We’ll give you that. But guess what? It wasn’t good enough! Various enemy forces successfully besieged and captured Richard’s beloved Chateau several times throughout history. The French King Philip II in 1204 took the Chateau the first time in 1204, only five years after Richard’s death. To add insult to injury: Philip’s forces finally broke through the fortress defenses after a soldier named Ralph discovered a latrine chute they were able to crawl through. That’s right: the French performed a reverse Shawshank Redemption and caught the English with their pants down–literally. What kind of impregnable fortress’ weakness is its toilets? You know who’s never been successfully sieged? A Storage Direct facility. That’s right, none of our enemies have ever been able to breach our walls with battering ram or catapult. And no one’s about to sneak through our toilets, trust us. Malik Ambar, an African-born slave-turned-diplomat, mercenary, rebel, and royal, built this famous Indian sea fortress in the 17th century. The fortresses’ name, Janjira, is derived from the Arabic jazeera, meaning Island. See, the Janjira fort, or Janjira Jal-Durg (sea fort), is an island. Note we didn’t say it’s on an Island. The Janjira Fort is located 3 kilometers from the Indian coast, in the middle of the Persian sea. A thick, 40-foot wall of stone forms a perimeter around the island. 26 rounded bastions are built into the wall. These once contained 572 cannons! Within the walls of Janjira is a freshwater well which draws from an underground aquifer. This well, along with fish from the sea and coconut trees, allowed fortress defenders to hold out against sieges virtually indefinitely. Meanwhile, would-be conquerors had to use boats to assault the walls. While Janjira shot at them. With 572 cannons. Yeah. No one ever succeeded in taking it. The warrior-King Shivaji tried 13 times, and the fort thwarted him each time. Shivaji’s son tried to take Janjira by building an underwater tunnel. When this failed, he used the dirt dug up to build a fort of his own near Janjira, from which he launched yet more attacks. These also failed. The island fort was so impregnable that for a long time it was an autonomous state for its Siddi creators. Janjira is about as close to a real-life cheat code as there’s ever been. We did a pretty good job of pitching Janjira as the ultimate fortress, didn’t we? You’re probably pretty skeptical about us beating it, huh? Well, listen: Janjira may have been a ridiculous, invincible game-changer, but one thing it wasn’t was convenient. What’s that? You don’t like fish? Kinda tired of coconuts? Well, too bad, because that’s what you’ve got. Forever. See, when you’re the King, everybody wants a piece. Remember how Shivaji was attacking constantly? He wasn’t the only one. Dudes attacked Janjira a lot. You’ll beat back these attacks, but it’ll get pretty boring. Day in, day out, you shoot the cannon, get some well water, shoot the cannon, eat some fish, shoot the cannon, go to sleep. With Storage Direct, getting in and getting out is as easy as driving your car to our facilities! There’s no boating, no protracted siege, no cannons. You’ll even be able to find a facility close to your house! You can pick up and drop your stuff without having to worry about some fabled warrior-king coming after you or your boxes of silverware. What’s that? Not a fair comparison? Well, the Janjira’s blog is free to write a counterpiece. Come at us, legendary wonder of the world. As we’ve so-effectively demonstrated, the ancient strongholds of antiquity got nothing on us! But we’re not done yet; we’ve got plenty more wondrous fixtures of history to embarrass with our superior security and customer service. Look for Part 2 of our castle smackdown next month, and in the meantime, consider us if ever you need some extra storage space. We’re close by, helpful, and–of course–safe, so find the right facility for you today!